I am excited to announce that I will be showing and selling my jewelry at an upcoming arts & crafts show in Portland, Oregon!! 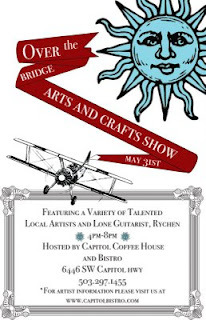 There will be a range of artists and crafters participating. The show is on a Sunday evening, there will be music, food and drink, so come check it out, what a fun way to spend a Sunday evening! I’ll try to stop by! That’s so neat! I probably won’t get a chance to stop by, even though I’d love to. Good luck! Good Luck my dear Cyd! I wish I could be there to help you! Good luck honey…and have fun!